Looking back at a few days in September. . . Zipping around Paris taking in all the events, art exhibits, new restaurants, new attractions never gets tiring. It’s all the work when I arrive back home and have to update my Pinterest, Twitter, Instagram, Tumbler and blog accounts. Complaining, I’m not, it’s a gig many have told me they’re envious of. I understand. After many years as a graphic designer, secretary, stone mason, aerobic dance teacher, chocolate chip cookie baker, and photographer, life has just worked out that way. While in Paris I had one minute of fame. Crawling the internet at night post Balmain show I came across the Vogue Magazine online site. Lo and behold there I was on point shooting one of the cognoscenti. Thank you staff photographer Phil Oh who included it in his “Best Street Photos from Paris Fashion Week.” It made my day, my year, though I guess that’s my ego speaking. Okay, enough about that. Time to get onboard and sell some books. No Worries Paris is on the shelf at Powell’s Books. Amazon.com too, of course or at www.trailblazertravelbooks.com. Thanks for giving it some consideration, it’s a pretty helpful walking guide to have along. 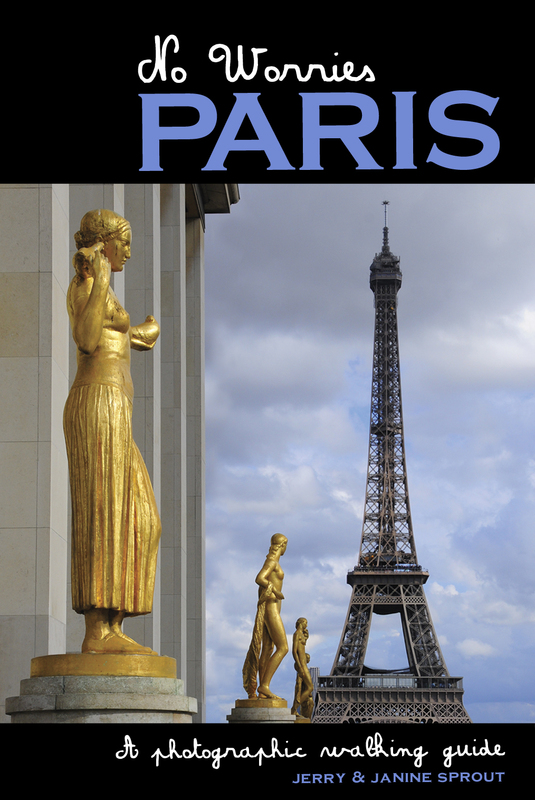 Paris’s “Winter Sales” began on January 11 and continue through February 21. It’s not just department stores that are having them. The big fashion houses are also in on the discount extravaganza and there are bargains to be had. The discounts are deep, 50 to 70% on selected items. Get there when the doors open, when everything is neatly piled and lines less long at the cash register. Some designers have to limit the number of shoppers in their department store boutiques. You’ll always see a queue of just-off-the-jetters who go for the big brand names. Values are waiting in the triangle d’or (Avenue Montaigne, Ave George V, and Rue Francois 1er), where the finest Haute Couture shops in the world are located. The prestigious houses include: Dior, Chanel, Louis Vuitton, Ferragamo, Dolce e Gabbana, Max Mara, Christian LaCroix, Valentino, Prada, Ungaro, Joseph, Bonpoint, Jean Louis Scherrer, Gucci, Pucci, Loewe, Krizia, Bulgari, Calvin Klein, Nina Ricci, Ines de la Fressange, Donna Karan, Celine, Yves Saint Laurent (headquarters), Bulgari, S.F. Dupont, Porthault Linens, Caron, Hermes, Gianfranco Ferré, Givenchy, Kenzo. Rochas, Courreges, and Balmain. Be prepared to have your purse searched before entering. Tired just reading the list? The Georges V (31, avenue George V) to the rescue with a time-out drink at Le Bar or light meal in the L’Orangerie restaurant. The staff are always gracious and welcoming; the flower arrangements will take your breath away. Sidenote: If you’re a guest, free flower arranging classes are offered by their world-renowned flower magician ($200 for non-guests); the staff offer guests a special morning hour-long jog at 7:30 along the Seine, through the Tuileries (free, once a week), room rates start at $800 a night. Chercheminippes, 124 rue du Cherche-midi 75006, http://www.chercheminippes.com. I promised myself to take a day off, however, as I scurried to the Apple store to buy a new external hard drive replacement, there they were, the guys in black with their cameras and tripods on the stairs of Opera Garnier. I couldn’t refraid and joined the mob. The Stella McCartney show was just ending and Carine Roitfeld, former editor-in-chief of Vogue Paris, stopped a few moments for comments. Not much security for the models once the show is over. And the grand finale: Kristin Scott Thomas, the actress and Parisian resident practicing her invisibility. Word on the street: The Kardashian robbery is taking it’s toll already. Security at the fashion houses tight. Guards barricade the doors and purses, shopping bags are routinely examined before entering. The YSL showroom on Avenue Montaigne not so busy, Chanel on the other hand full of clients. It will be interesting to see how it all shakes out in the coming months. Saturday’s work. Paris never sleeps. The dream job . . .
And how I ended the day. The start of Nuit Blanche, an event of various manifestations (performance art) taking place all over the city and lasting until 7 am. Can’t get enough of Fashion Week. Here was the scene at Jardin des Plantes, the Christian Wijnants show. Rain threatened but all was rosy for the stunning event. And then there were the spectacular plants for dessert.